Steve came to New Mexico to study Geochemistry at New Mexico Tech. He started exhibiting bipolar symptoms in college which prevented his finishing that degree, and started him on a path toward behavioral health advocacy. This doesn’t stop him from going outside and climbing on, breaking open, and collecting rocks whenever possible. He was integral in developing the Crisis Intervention Training for the Albuquerque Police Department, which trains police in de-escalation techniques for peers in crisis. He has sat on various boards including for the Mental Health Response Advisory Committee, the Albuquerque chapter of the National Alliance on Mental Illness, the Bernalillo County Forensic Intervention Consortium, and the Albuquerque chapter of the Depression & Bipolar Support Alliance. Steve has been trained in the NAMI Signature Programs ‘Peer To Peer’, ‘In Our Own Voice’, and ‘Connection’, as well as the education program ‘Breaking The Silence’. Steve has also taken part in advising on Bernalillo County and City of Albuquerque mental health programs (such as the Community Engagement Teams), and state and federal mental health legislation. He is also a certified peer support worker. In 2017 he was awarded a Lifetime Achievement Award in Behavioral Health Innovation from the State of New Mexico at the age of 46. 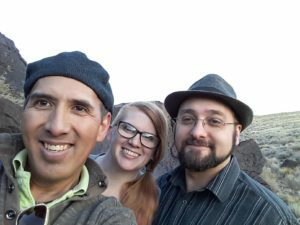 Sarah received her Bachelor of Science degree in Psychology from the University of New Mexico in December of 2015, just a few months before she was diagnosed with bipolar disorder. The diagnosis helped explain why getting that degree was such a grueling battle. She has nearly 4 years of experience as a research assistant in various neuroscience labs where she has been trained in data collection, processing, and analysis. She has been serving on the board of the Albuquerque chapter of the Depression & Bipolar Support Alliance since January of 2017. She also loves metal music and knitting. Ryan holds a Bachelor of Arts degree in Animation from the Southwest University of Visual Arts. He has been teaching animation, graphic design, web design, digital painting, and 3D modelling, among other things, at a media arts charter high school for 6 years. He has been rated an Exemplary or Highly Effective teacher for his entire teaching career. He is on the Autism spectrum and recently sought treatment for depression after realizing the stigmas that were holding him back. Ryan enjoys video games, movies, and all things technological.